We’re exploring how growth and development could happen in a meaningful way for the 16th Avenue Co-op location. If you live, work, play or travel in the area, we want to hear from you. Co-op, in conjunction with Quarry Bay Investments, have submitted a combined development permit and land use redesignation (re-zoning) application for the site located at 540 16 Avenue N.E. (the existing 16 Avenue Co-op site) in the community of Winston Heights-Mountview. The development proposes 5 buildings including a supermarket, liquor store, financial institution, office, gas bar, car wash, and 115 residential units. A concurrent development permit has been submitted with the land use application to redevelop the site. The application number is DP2017-3939. Note: The existing Co-op grocery store will remain open and operational until the new store is completed and ready to open. There will be no disruption to the operations of the existing Co-op grocery store. For additional information and other FAQs, please click on the FAQ tab above. The new Co-op grocery store is proposed to be approximately 41,000 square feet, while the current store is approximately 30,000 square feet. Yes, the development is proposed to incorporate several phases: The first phase involves the construction of a new gas bar at the Far East end of the site. 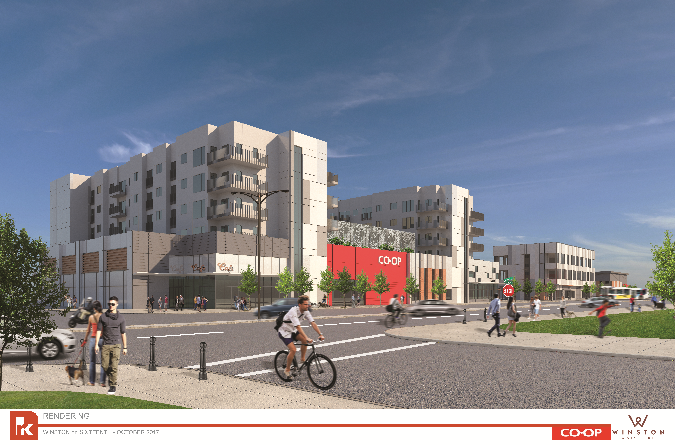 Phase two involved the demolition of the existing gas bar and office building, followed by construction of a mixed-use building including the new Co-op grocery store and 115 residential units. Phase three will include the demolition of the existing Co-op store and the construction of a new car wash. The final phase involved the construction of a new office building and liquor store. The new buildings incorporate a range of proposed heights. The tallest building includes the new Co-op and will have a maximum height of 6 storeys (22 meters), the second tallest building is proposed to be 3 storeys (16 meters) and is located along 16th Avenue. The development is proposing a total of 115 residential units. Will this application result in any changes to the Area Development Plan? No anticipated changes to the Area Redevelopment Plan are currently contemplated with the plan. Are there any details that can be shared about the residential component – what size will the units be? Will this be targeted for students, seniors, families or rentals? The application proposes a mix of one-bedroom and two-bedroom units. What bank will be located on site? First Calgary is the proposed tenant for the financial institution. Can you please explain how the parking allotment works? How many spots will be for residential vs. commercial? The bylaw requires 343 parking stalls. 264 parking stalls will be provided underground on 3 levels for commercial and residential use and 125 parking stalls will be provided on surface for commercial uses. This is a total of 389 parking stalls. How many parking spots exist on the site today? There are currently 186 parking stalls that exist on the site today. Will there be separate staff parking available? Based on The City of Calgary’s criteria for shadow studies (between March 21 and April 21 from 10:00 am to 4:00 pm), no adjacent developments (including Munro Park) will be impacted by shadows from the development. Shadowing is limited to adjacent roads. We assess the traffic generated by the new development, and add this to projected future traffic to see if nearby intersections can handle the increase. We also include any other development and roadway projects we know are coming in the future timeframe. We assess the level of congestion and delay against accepted industry standard to determine if any improvements are required to the roadway network. These improvements could include, but are not limited to: change of signalization, introduction of a new traffic signal, addition of roadway lanes, improvements to transit or bicycling facilities, and restriction/removal of on-street parking. If upgrades are required, these are paid for by the developer. Why is there no longer access from 17th Avenue/ 4th Street? 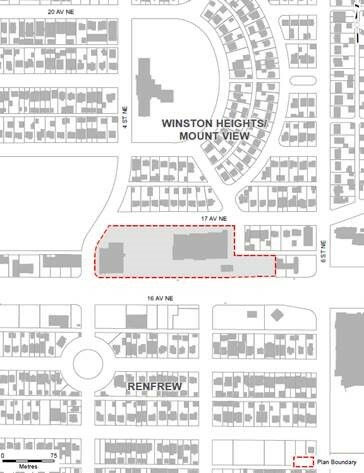 The proposed access points from 16 Avenue only is intended to limit traffic on nearby residential streets. This is currently under review. Will the lights still exist at 16 Avenue and 5 Street to enter the site? The existing lights at 16 Avenue and 5 Street will remain and are aligned with one of the proposed access points. Who will be developing this site? What is the timeline for this project to be complete? Once a Development Permit is issued (which is anticipated May 2018 and pending approval of Land Use Redesignation by Council) the applicant will have 2 years to begin construction. Thank you for providing your feedback. A summary of feedback can be viewed in the What We Heard Report. Citizen feedback provides Administration and City Council with valuable, local knowledge of the community and the proposed development area. The citizen input provided through our engagement program will help inform Administration’s detailed review of this application. Administration will be sharing all engagement results with the Applicant and we will be using your feedback to inform our recommendations to the Applicant. Once Administration is ready to make their recommendation for the application, all input gathered through all phases of engagement will also be used in reports provided to Calgary Planning Commission and City Council. First detailed team review sent to applicant.